Many of us desert dwellers daydream of the soft crashing waves and ocean breeze as we make it through our hottest summer months. In fact, the coast it’s where most of go to escape our summer heat. I think this may hold true for a lot of people who don’t live by the water, so it’s not far-fetched that you might see coastal themed parties all over the country. On a recent family trip to Maui, I found myself in a tiny home decor store in the hippie beach town of Pa’ia. They carried some of the cutest coastal table decor and I hand-carried my purchases home on the plane. 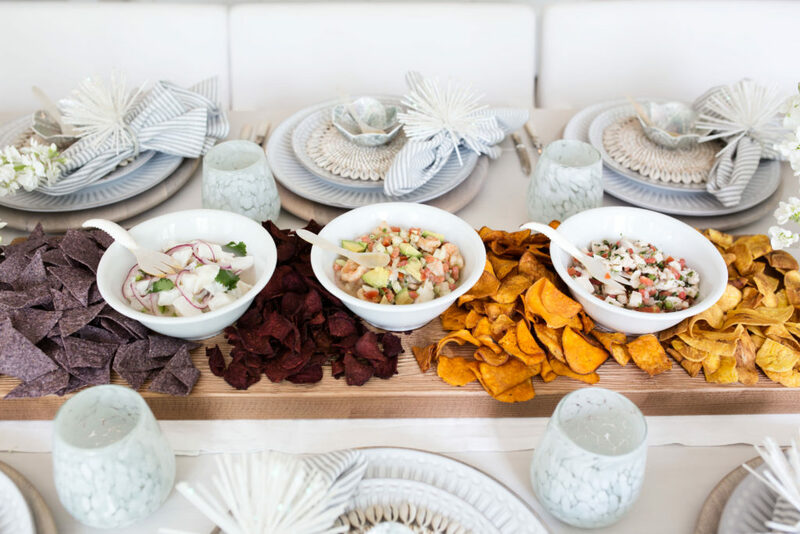 That’s how I came up with the idea of this beachy ceviche party with an edible table runner! 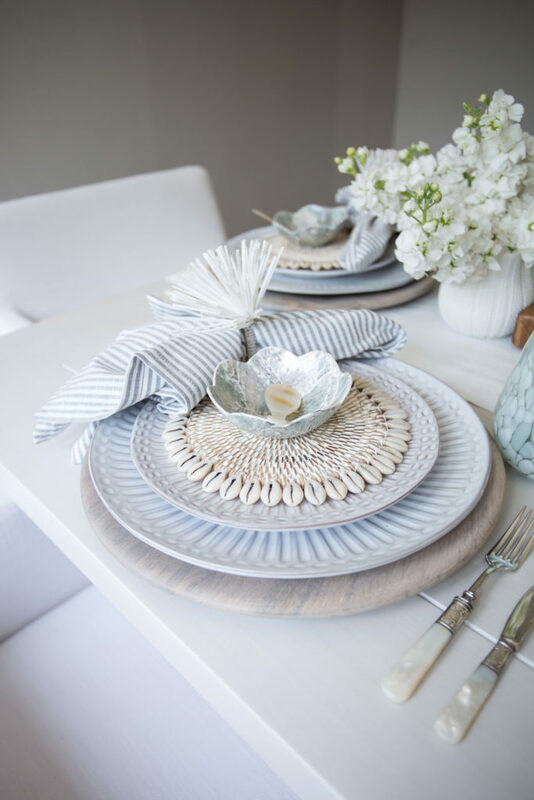 Coastal vibes for this beach-inspired dinner! This is a party that can be thrown all year round – it doesn’t need to be reserved for summer only. 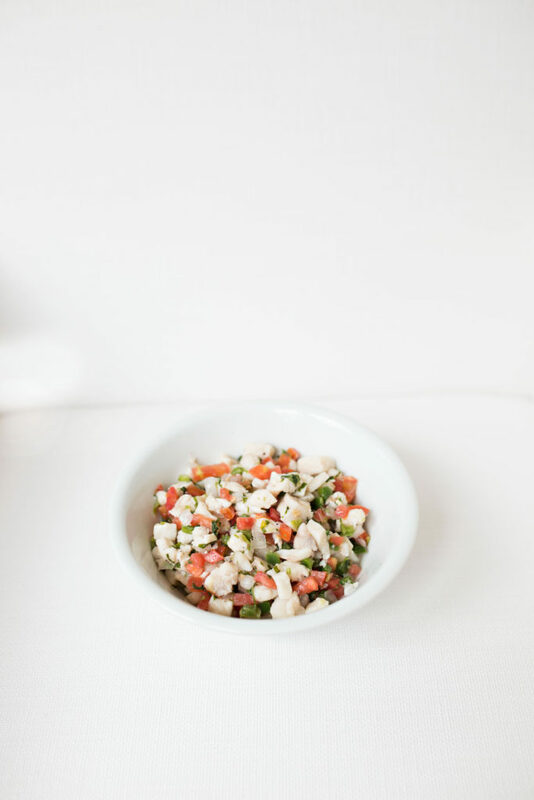 Ceviche is such a great dish to serve when hosting, mostly because it’s really easy to make, looks and tastes elegant, yet is quite literally thrown together in a matter of minutes. You can also have lots of fun experimenting with flavors, making it a wonderfully versatile dish. Read on for more details on executing this beach-themed ceviche party! Tulip-shaped iridescent oyster bowls caught my eye the second I saw them at Pearl Butik and these delicate pearl spoons were the perfect piece to accessorize. 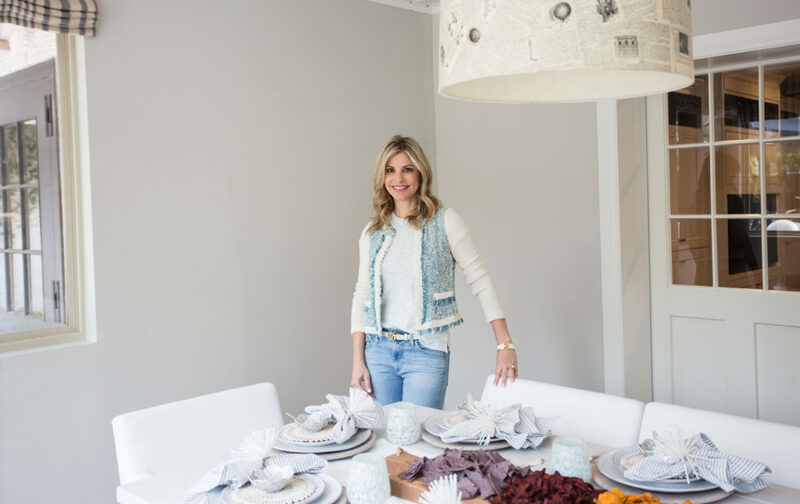 Keeping with one of my favorite table decor tricks, I layered the dishes upon dishes for depth and interest. In addition to the bowls, I also found these darling shell-rimmed rattan coasters. Slightly larger than a cup coaster, they were a great size to hold the ceviche bowls. White plates are a mainstay at my home, but I wanted something a little different. These glazed terra-cotta dinner and salad plates are from Anthropologie. The classic design lends to everyday use, with a little bit of flair in the fluted rims. 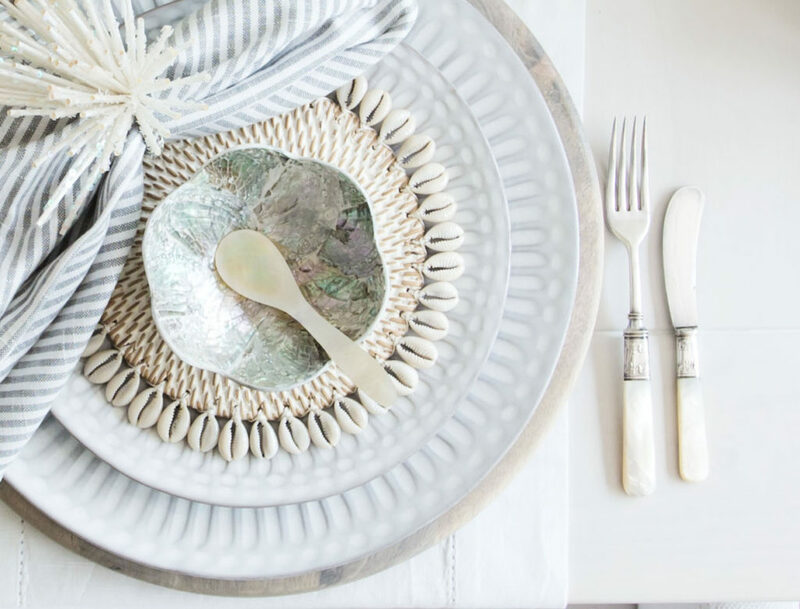 Reminding me of spiky sea urchin, these white napkin rings by Kim Seybert provide a beautiful finishing touch to the place setting. 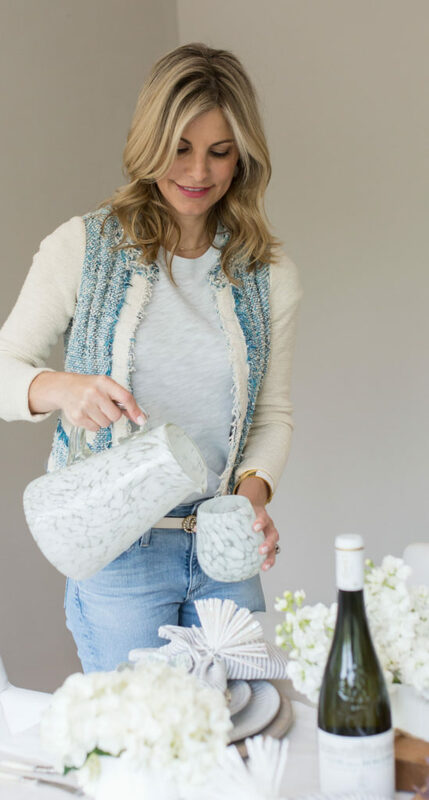 The tiny sequins add whimsy, but they’re elegant enough for any tabletop. Hand-blown recycled marbled glasses give a funky edge to the table and could be used with a variety of table decor. Incorporating table runners that you can actually eat are super popular and such a fun way to encourage conversation between your guests. An ombre row of chips across my long Europe 2 You board provided not only a vehicle for the ceviche, but also a spectacular centerpiece. Tortilla chips are traditionally served with ceviche, but I thought it would be fun to change it up a bit and use something different. Starting with plantains, I then used Terra sweet potato chips, followed by Terra beet chips and ended with blue corn tortilla chips. Functional, tasty and beautiful! 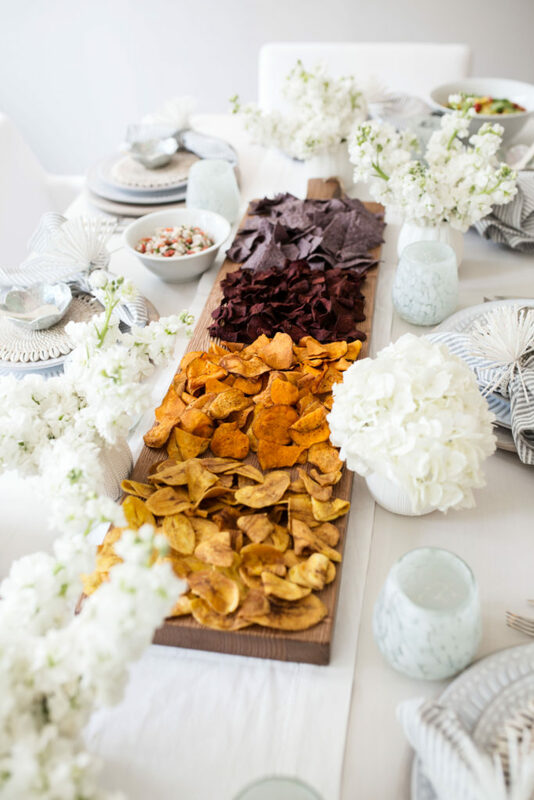 Everyone’s free to grab the chip of their choice here – that’s the beauty of edible table runners! 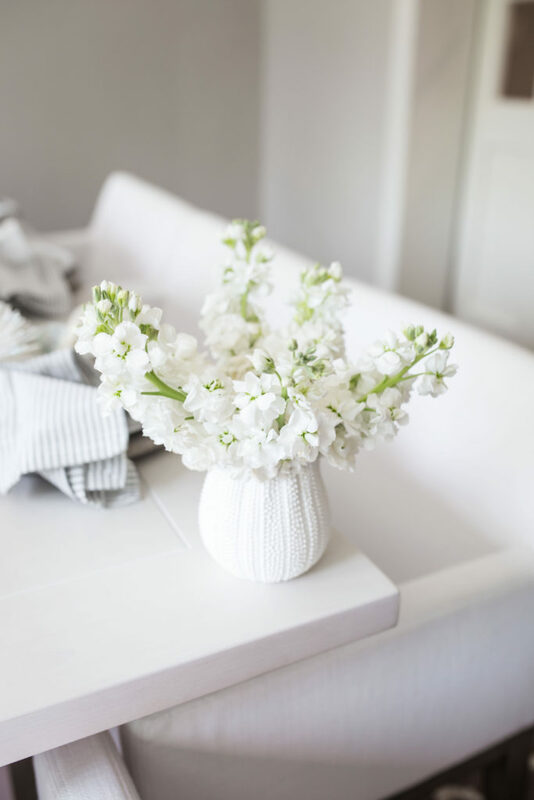 Using all white flowers, I purchased only two varieties (stock and hydrangeas) to keep it simple. I put them in my favorite white Aerin for Williams Sonoma votive holders, which I often repurpose as small vases. Textured with raised dots to resemble a sea urchin, these were ideal for this table. Pro Tip: Trim your flowers directly on the table so you know they will fit while not obscuring anyone’s plate. 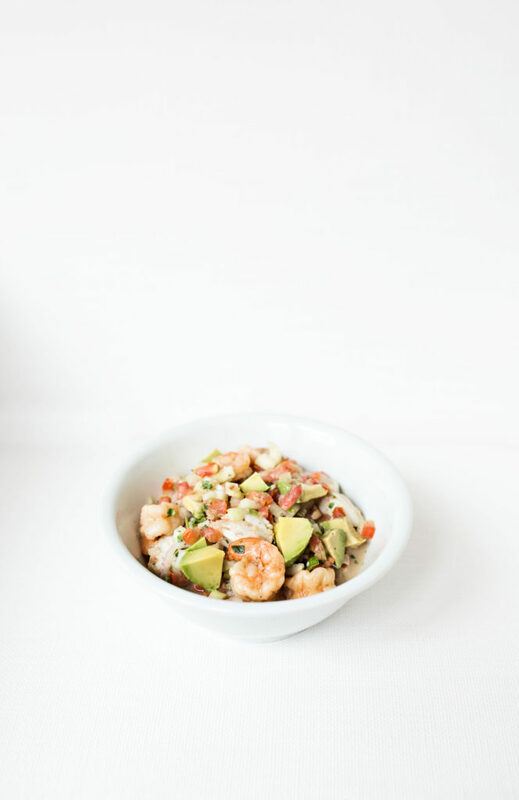 Serving up a variety of ceviche ensures everyone gets what they like and your guests get to try different types. Here, I offered a trio of Mexican, Californian and Peruvian flavors. I actually purchased the Mexican and Californian ceviches, and made the Peruvian version. 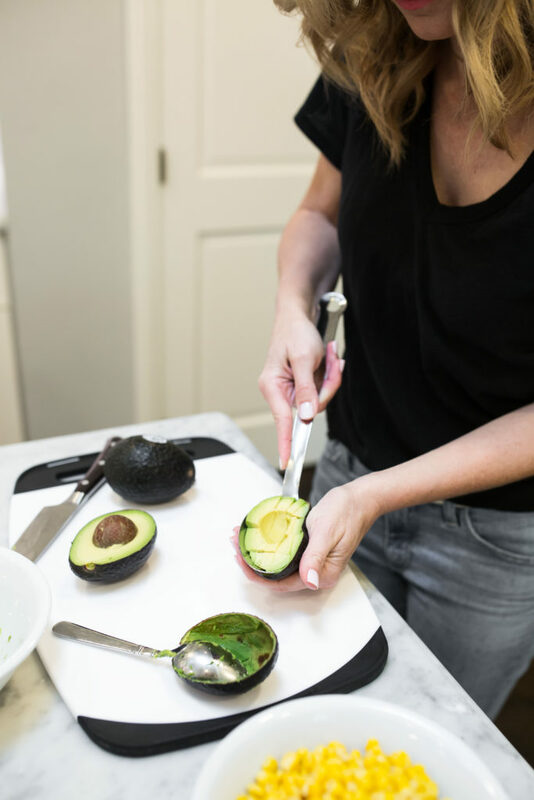 Pro Tip: If you don’t want to make your own, check your local Mexican or seafood restaurant, Hispanic foods market or trusted fish counter for pre-made ceviche. Buy the same day you are serving it for the brightest colors and freshest flavors! 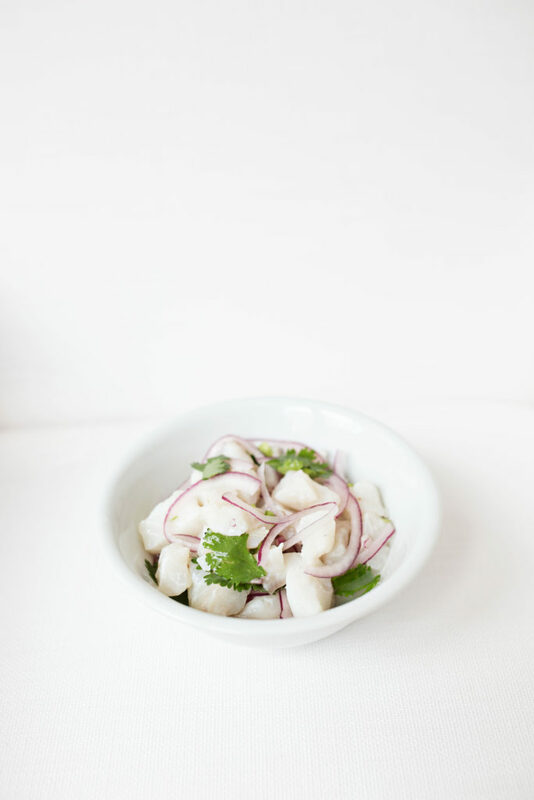 Check out my post for a step-by-step on how to make Classic Peruvian Ceviche. Lime juice gently cooks the fish in its citric acid – only 5 ingredients for this recipe! Pro Tip: Buy only the freshest fish from a trusted source for ceviche. Super refreshing and light, this is a great salad to complete any meal! 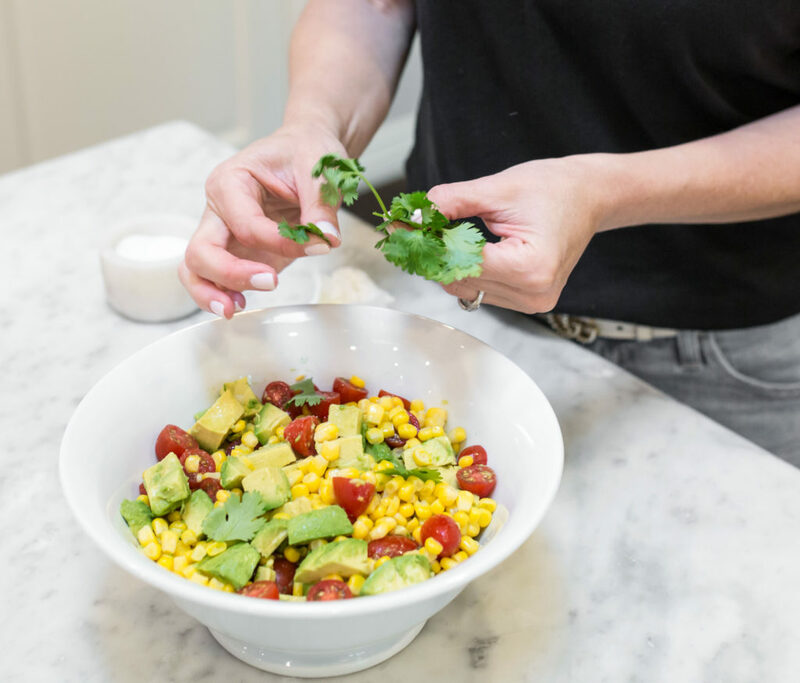 Side dishes can be tricky with ceviche, so I kept it simple and made a corn, avocado and tomato salad from Paula Deen. You can use either fresh or frozen corn and either cherry or grape tomatoes. These ingredients are available year-round, making this a great option no matter the season. 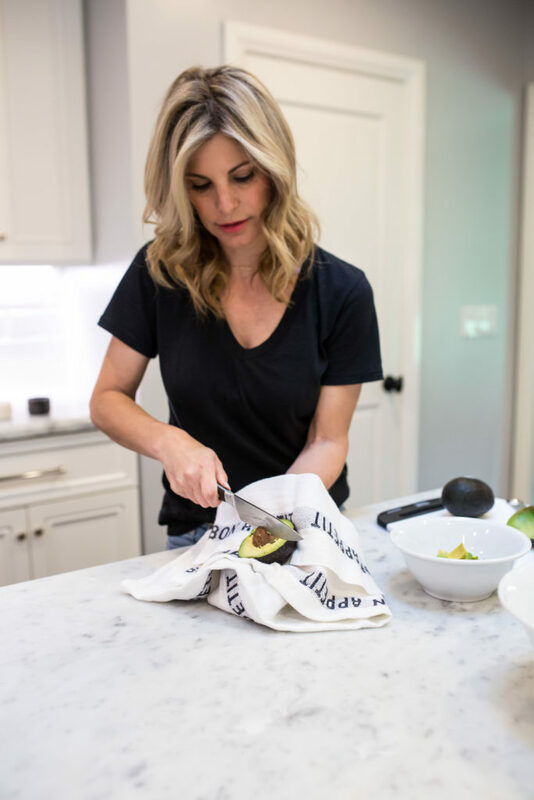 Pro Tip: When slicing an avocado, protect your lower hand with a thick dish towel. Remove the pit and to cut into slices. 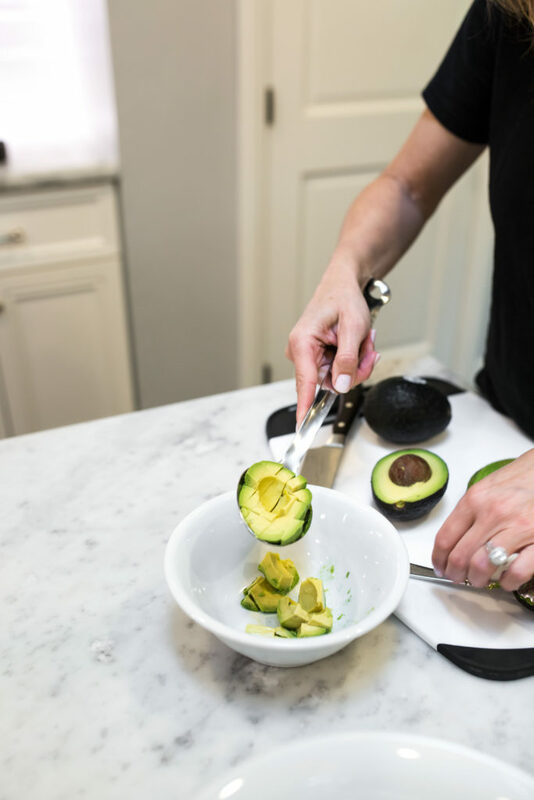 Use a large serving spoon to remove the avocado slices in one piece. Wine that pairs well with ceviche should be high in acid and preferably a white. Sauvignon Blanc, Grüner Vetliner or sparkling wine complement the citrus and fresh fish flavors, and would make a good choice. My idea of desserts = they’re store-bought or I ask a guest to bring one! 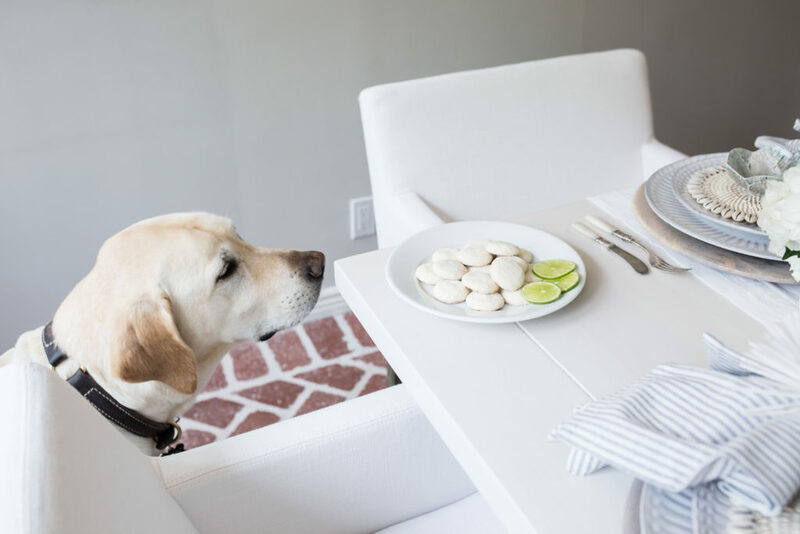 These key lime cookies from Trader Joe’s are tangy, light and a great ending to this meal. Palmer agrees that store-bought is perfectly fine here! 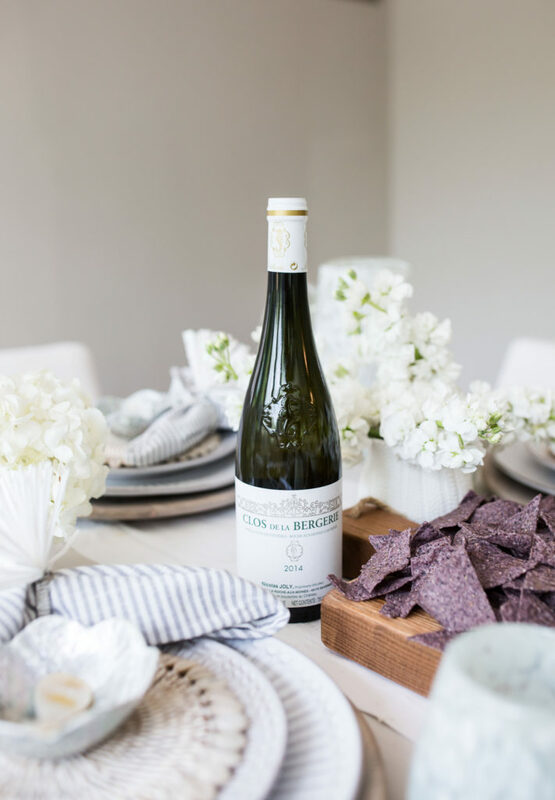 Beach-inspired parties aren’t just for summer and this is one you can throw year-round. I just love the idea of an edible table runner. So creative! And I love the idea of a meal centered around Ceviche. Great stuff Lory! I love Ceviche and had forgotten all about it. Beautiful presentation, of “course”. Your tables are truly amazing. Glad I am back on track seeing your amazing ideas.